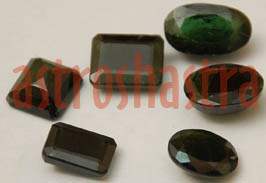 Green Tourmaline Gemstone comes in various colours like blue, green, red, reddish brown, pink etc. It is a recommended stone for thsoe wishing to improve their financial position and status. It is the most common member of the tourmaline family. It gets its color from lithium, sodium, and potassium trace minerals. 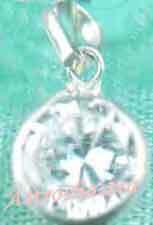 In fact, elbaite is sometimes called lithium tourmaline. The most valued color is an emerald green, and sometimes the darker green tourmaline is heated to approximately 1,000 degrees Fahrenheit to pro¬duce this green. It gives emotional balance through helping you let go of expectations about how things should be. It helps you detach from a nation in a nonjudgmental way. Green tourmaline can calm anxiety as you go for job interviews or when your life takes an unexpected turn. If you find yourself worrying or saying "what if," as you prepare for an endeavor, green tourmaline will calm you. Green tourmaline has a way of balancing emotional highs and lows so that you can let whatever happens happen with more equanimity. It is also good for wishing to have a greater concentrations in studies and those appearing in competitive examinations. It is also good for those who wish to be slim and trim. 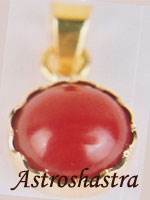 It can be used by all for good luck and prosperity as it has no evil effects. It can forewarn the wearer of any mishaps. Green colour gem is beneficial for businessmen and those who are engulfed with problems of one kind or the other may use the gem in Pink Red. It is very useful for politician, leaders, writers etc. It should be worn in silver only.